Know (a lot) more about our colorful local language. Today's the first day of the much-awaited -ber months, which also marks the end of Buwan Ng Wika. If for preschool students, celebrating National Language Month is as easy as wearing their newly bought alpombras and Filipinianas or bringing native chow for their baon, busier Pinoys now can't even do the simple gesture of putting their hand over their heart when they hear the national anthem. Well, we're not quintessential countrymen ourselves, as we admit to not being consistently nationalistic. However, what we could be proud of is our sound grasp of the local language, despite primarily writing (and, ahem, conversing) in English. 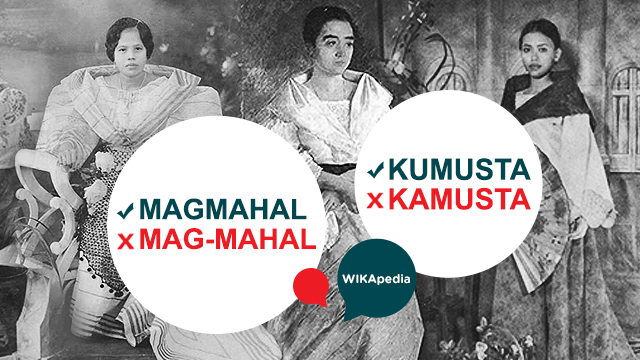 Helping us in our quest for greater command of the Filipino language is the Facebook page WIKApedia, which is supervised by the government's Official Gazette, in cooperation with the Komisyon sa Wikang Filipino. And August being quite a special month, WIKApedia gave out a healthy dose of Buwan Ng Wika lessons to commemorate the annual celebration while at the same time helping forgetful and preoccupied Pinoys to brush up on their Filipino. Help yourself to a heaping of brain food and dig in! Yam Concepcion Is FHM's September 2015 Cover Girl!